The cold is biting. I’m waiting outside of Ideal Glass in the East Village, my hands in my pockets and my neck craned towards the sky as I marvel at the masterpiece plastered across the old concrete exterior of the building. 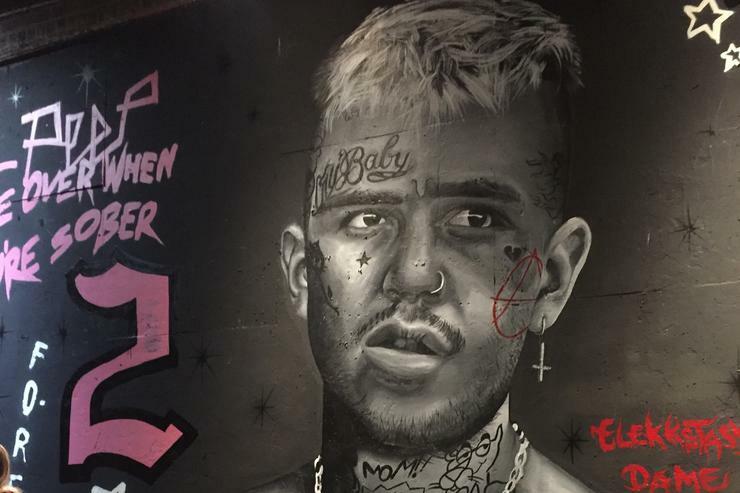 The black and white mural capturing the iconic Adam DeGross photo dwarfs the restless attendees who huddle along the edge of the sidewalk, fully immersing themselves in the breathtaking rendering of Gus Åhr, known professionally as Lil Peep. The energy is palpable. Earlier in the week, Come Over When You’re Sober Pt. 2 was formally announced on Peep’s Instagram page, leading to speculation that the album rollout was just around the corner. “Cry Alone,” the first single from the project, arrived on October 18th to an overwhelming response: the accompanying music video, which features footage of the rising star while he was alive, has well over 35,000 comments from adoring fans. As I enter the venue, it becomes abundantly clear to me that the same love and devotion is present, nearly a year removed from the passing of one of music’s most auspicious talents. To quote Jay Schumer from Columbia Records, “Gus is all around us.” Beneath the dim glow of the pink and purple spotlights, folding chairs are arranged in solemn rows before the small stage. A playlist of Gus’ favorite music gently cycles in the background, while slideshows of photos, music videos, and interviews play on the opposing brick walls. Jack-o’-lanterns carved with Gus’ likeness and stylized signature complete the setup, paying homage to his favorite holiday. At the front of the room is an enlarged projection of the album artwork for the forthcoming release, Gus’ shadow framing his gaze.